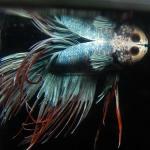 I'm Jerrico, and I'm new to this forum, and fresh from a freshwater environment. Took a leap and converted into saltwater because I have been mesmerized by the colours and characteristics of sw fish and corals alike. I'm hoping to learn the basics of keeping a healthy saltwater tank, as well as a few tricks from the masters =) I currently have a 29 gallon running a penguin 350, koralia 2 and ~30lbs of live rock (20 pukani and 10 fiji). I'm currently into the 2nd week of cycling process I think. Hoping to put in some small snails, hermits, and 2 shrimps for my CUC, as for live stock maybe I'll stock it with a O.Clown for the first few weeks after cycling. Welcome to the forum! Glad to have you aboard! We love pictures of tanks and setups so feel free to post a picture when youre ready. Welcome to AA! Nice rockwork! Thanks redsea! And welcome to AA Rose!